BOOM! Studios announced today that it is developing an all new original ongoing comic book series based on the Disney Afternoon animated TV show Chip ‘n Dale Rescue Rangers. The first issue will be written by Darkwing Duck’s Ian Brill with art by Leonal Castellani. The new monthly series will debut this December. 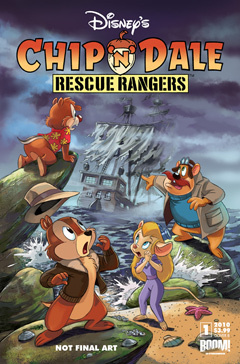 Chip ‘n Dale Rescue Rangers comics were previously published in the United States in 1990 and 1991 by Disney Comics Inc.. The TV show ran for 65 episodes from 1989 to 1990. This entry was posted on Friday, September 3rd, 2010 at 12:10 pm	and is filed under Boom! Studios, New Titles, United States. You can follow any responses to this entry through the RSS 2.0 feed. You can leave a response, or trackback from your own site. I’m pleased that you’re doing great things with the Disney line of comics. Keep up the good work. Hey – that means Tale Spin is next, right? It has to be! 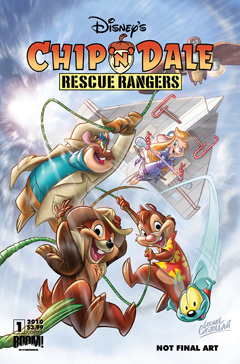 Disney Comics Worldwide is an unofficial website with information on Disney comics and magazines from around the world. With approximately 50% of the market, Disney is the largest publisher of children's magazines and comics (excluding manga) in the world! I'm Arthur and on this blog I write about Disney comics news, new comic book releases and other Disney related stories. If you have any news about Disney comics please don't hestitate to contact me. Fantagraphics to Publish Complete Floyd Gottfredson Collection! All pictures and images of comic covers and Disney characters are © The Walt Disney Company. This is an unofficial website. It is maintained by Arthur de Wolf with the help of publishers, collectors and fans. Information in the DCW database may be not be up-to-date and may contain errors.